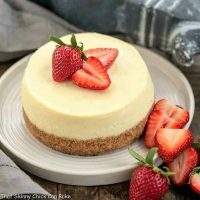 A small creamy cheesecake that may be the best you’ve ever tasted! Spray a 6-inch springform pan with non-stick cooking spray. Wrap the pan in a layer of aluminum foil and set aside. If you don’t own silicone IP sling (see link above), make a homemade version with foil (link to complete instructions above). Combine the graham cracker crumbs, butter and sugar in a small bowl. Press onto the bottom of the prepared pan and about an inch up the sides. Beat the cream cheese with your mixer fit with a paddle attachment until smooth, then add sugar and vanilla bean paste and mix until combined. Beat in eggs, one at a time just until incorporated, then mix in cream. Scrape out the cheesecake filling into the springform pan and smooth the top with an offset spatula. Add one cup of water to your Instant Pot, then place trivet in the bottom. Place your sling over the trivet, then set the cheesecake on top of the sling. Seal your pressure cooker and set on high pressure for 25 minutes. When the timer goes off, allow the pressure to reduce naturally. Carefully remove cheesecake from the instant pot to a cooling rack. Use a paper towel to dab any moisture that has accumulated on the surface. When cooled to room temperature, place in the refrigerator and chill overnight for the best results.